Wrong Direction Farm | Real food, from our farm to your family. Always grassfed and pasture raised. We had a bulldozer in yesterday cutting a couple of terraces on the steep hill behind the house, making room for a few new chicken brooders. If I could have all the money I’ve spent on terracing over the years, I could buy about four extra acres of flat land. But extra acres aren’t on the market, so we’ve got to make use of the land we have. After creating the terraces, we dumped and spread six loads of gravel, moved two shipping containers into position, and graded the area to make room for the new chicken brooders. The smaller shipping container will be used as a storage shed for all things poultry related, such as spare parts for feeders, water lines, extra hose fittings, etc. Implementing better systems for organizing supplies and equipment is a high priority for this year. It doesn’t look like much, but to us it is a big relief to have this area properly prepped. Free home delivery on all orders over $99. Orders under $99 will have a $9.99 flat fee, which is also lower than our previous fee. Two delivery dates every week. Packages will arrive Wednesdays and Fridays except when there are conflicts with holidays. We are now including eggs in home delivery. 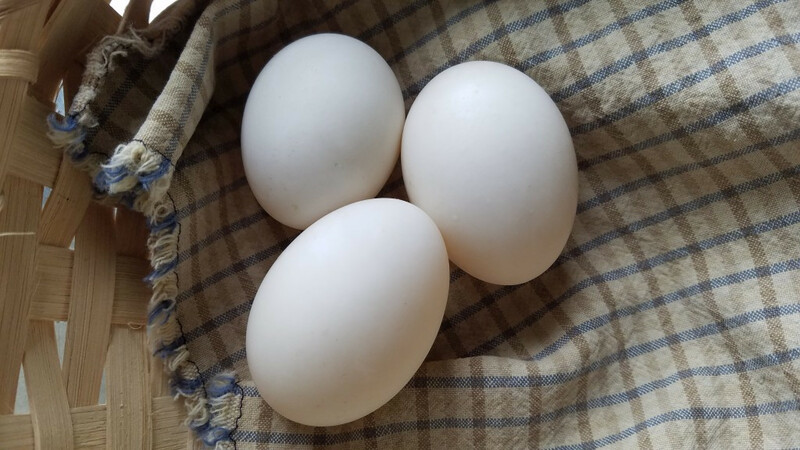 Because of the custom packaging to protect them, our home delivery options will include packs of 2, 4, 6, 9, or 15 dozen eggs since those are the size packages that work with our shipping materials. If you are one of our Neighborhood Delivery customers and you’d like to switch to Home Delivery, you may do that by choosing Home Delivery at checkout. The shopping cart may ask you to remove the eggs from your current order and to add them again. If you have any questions about the process, send me an email and I’ll help you out. As the snow releases its grip on the fields, the laying hens are ranging farther afield each day. There are tantalizing little hints of green among the brown thatch of grass. It is instructive to watch the hens forage at this time of year. Surprisingly, their first objective isn’t to eat all the tiny green shoots. They actually are eating a lot of the old dead grass. But their favorite thing is to scratch through matted leaves and sticks that have been plastered to the ground all winter. Under the leaves they find the first insects and worms of the season. It looks to me like they are eating wispy fungal strands, although it is hard to be sure because they go after everything so quickly. That all makes sense as something deep inside their bird brain reaches back to their jungle fowl ancestry. This year I’m making efforts to approach our farming operations more systematically to make things easier on everyone. Chicken production is the focus since that’s where we’re putting the most work these days, and that’s where things have always been the most chaotic. I finished wiring the newest chicken brooder trailer today. Our brooders have evolved steadily, but the system for controlling heaters, ventilation, cooling fans, and lighting schedules has gotten out of hand. I’m adding more electric controls to the system, but in doing so my goal is to reduce the complexity of the daily workload. In our other brooders things are so tricky that I am the only one who knows how to work all the doodads, and sometimes I stump myself. I want to make it something that AJ can easily handle with daily checklists and that he can maintain when I’m away from the farm. All the controls will be labeled and each checklist will have the settings for the chicks at their stage of life for that specific day. Since we are using automation, I also am planning for overrides or workarounds in case any of the controllers fail. In the course of planning out the control system, I realized that one important requirement in making the brooders easy to operate was putting knobs on all devices. Too many timers, thermostats, lighting controllers, etc., are moving away from knobs to LED/LCD screen readouts. The problem is that each device uses some weird programming sequence, and no two devices use the same sequence. Hold down the PRG key for 5 seconds, then scroll through a bunch of forgettable abbreviations, then hold down the RUN key for 2 seconds to set the program. Wait, was I supposed to hold down PRG again before RUN? Just checking the temperature settings can require pressing ten key strokes. This is stupid. Knobs are just a far better interface for this application. If today I need to set the brooder thermostat to 90 degrees, I don’t need to study a manual to understand the keystrokes; I just point the knob’s arrow at 90. In two days when the chicks need less heat, I can twist it back to 85. Simple. Easily remembered. Easily verified. Easily communicated. Perfect. Also, for the daily almanac, we all enjoyed being outside on an extraordinarily warm day. I chopped a path in the ice at the bridge to ensure that the meltwater had a place to go. The ice and water was up to 3 inches from the underside of the bridge and I was concerned that it might wash the bridge out. After I got a channel carved in the ice, the rushing water cleared a path and after a few hours dropped the water level to a safer height. Later, because the weather was so warm I was able to caulk the leaks in the brooders’ roof. The kids climbed up too. I’m not sure what there is about a roof, but roofs demand to be climbed upon. Maybe it is something about the new perspective. Everything looks different when standing on a roof. I’ve had Townes Van Zandt’s rendition of Dead Flowers stuck in my head all day, ever since I came across a patch of dried Black Eyed Susans in the hay I was feeding the cattle. I suppose the combination of the dead flowers and the “little Susie” reference made the connection inevitable. There are a bunch of other Black Eyed Susan songs in the folksy or rootsy that could have been contenders, but today Dead Flowers just seemed to demand that I keep humming it as I fed the cattle and worked on the chicken brooder. Perhaps writing this post will finally get it out of my system. Flowers are typically more broken up by mowing, raking, and baling, but I was surprised to find dozens of intact specimens in this bale. Hay bales are time capsules, archives of the plants that were growing at a particular season and place. They vary from field to field and even within the same field. Seeing these colors, faded as they are, provided a little boost of expectation for the coming summer when we’ll be surrounded by blooms. Winter is great, but summer is always better. The cattle didn’t offer any comments on the presence of Black Eyed Susans in the hay. They simply ate it. 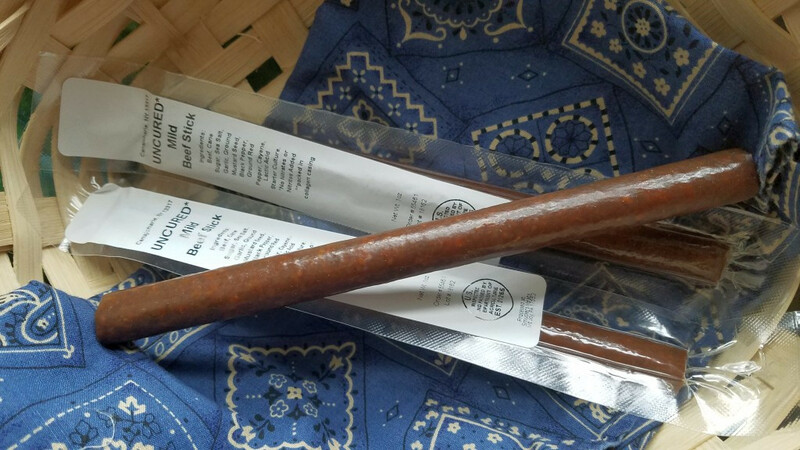 Last fall we tried a small batch of beef sticks and we completely underestimated just how popular they’d be. We sold out in a few weeks. We’ve restocked with a bigger stock of beef sticks. We also tried a small test run of a slightly spicier beef stick. Individual sticks and ten-packs are listed on the storefront here. The beef sticks are produced with traditional charcuterie techniques using lactic acid starter cultures and allowing the meat to ferment briefly. This is the same bacterial fermentation process employed when starter cultures are used to make sauerkraut, pickles, or yogurt. Meat doesn’t have much in the way of available carbohydrates so we need to add sugar to feed the bacteria. As the sugar is consumed it is converted into lactic acid, that pleasantly sour taste we crave in our favorite fermented foods. The combination of lactic acid and salt, along with the smoking and progressive air drying processes that follow, make the beef sticks naturally shelf stable without the need for any nitrates or other chemical preservatives. The hoophouse roof was whipping in the wind and the building’s framework hummed and shuddered while I held onto the corner of the tarp, scrabbling to keep my feet under me, to prevent the roof lifting me with it. I had the end of a parted anchor cable wrapped around my hand. I could feel capillaries busting in my finger tips, but after a few minutes the loss of circulation made my hand go numb. If I released the cable, the entire covering was liable to tear free as the wind would sequentially overload each of the anchors down the line. I had arrived home from a trip to the hardware store to find the cover of pigs’ hoophouse torn free from its anchors. The windward side was billowing up several feet above the metal framework. The nearest weather observation point in Hessville shows that the wind at that time was gusting up to 70 mph and holding steady around 35-40 mph. I ran into the house to call Rachel and then grabbed a handful of straps and some fence wire, and rushed back out. Once Rachel came out we worked together to slip a ratcheting cargo strap around the end of the cable and we winched the tarp back down. It isn’t a repair that is certain to hold, and this storm is still blasting us with stronger winds forecast overnight. But it is battened down for now. The wind is our friend, anyway, he thought. Then he added, sometimes. Santiago’s monologues in The Old Man and the Sea resonate with our experiences farming. We end up in ridiculously lopsided scenarios, faced with elemental forces. We identify with his predicament, poking around the bottom of the skiff trying to kill a shark with just a fishing knife and some scraps of wood. As hard as it is to face these situations, there is an exhilaration from having improvised a way out of a near-disaster. Avoiding near-disasters altogether might be a wiser way to live, but I haven’t learned the knack of doing that yet. I think the Great DiMaggio would be proud of me today. The ducks have come out of their winter break as the weather has warmed up and they are laying eggs again. I’ve added duck eggs back to the inventory. The “sort of” disclaimer is because we only have a small flock of ducks, so the quantities available are limited.